The first comprehensive national atlas of distributions of birds was published by the British Trust for Ornithology in 1976, based on surveys carried out in 1968-72. At twenty year intervals since, two further surveys have been done, with increasing levels of information collected, including for the 2007-11 atlas both breeding and winter season abundance surveys. In conjunction with the national atlas surveys, surveys of all the tetrads in Berkshire were carried out in 1987-9 and used for the first edition of the Berkshire Atlas and Avifauna (Standley et al, 1996). Surveys of all tetrads were again carried out in 2007-11 and these form the basis of the distribution maps in the 2013 edition of The Birds of Berkshire (for the 1968-72 national atlas, surveys were based on 10km squares and a county atlas was not produced). The Birds of Berkshire Atlas Group, sponsored by the Berkshire Ornithological Club and the Newbury District Ornithological Club, was established to manage the 2007-11 atlas project,which was supported by many hundreds of people who have contributed to the project as surveyors, as contributors of species accounts and in myriad other ways. Generous sponsorship enabled the proceeds of sales to be committed to the BOC’s conservation work through the Birds of Berkshire Conservation Fund. 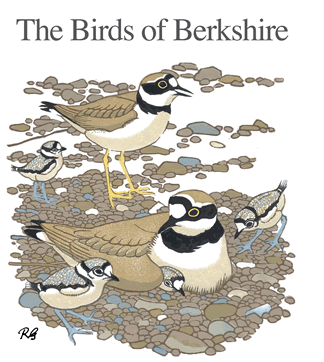 A fully revised Birds of Berkshire Atlas and Avifauna. with accounts of all 328 species recorded in the Royal County, was published in 2013. Supplementary information and corrections were made available for download in 2017 and a pdf of the amended book is available to purchasers (contact conservation@berksoc.org.uk). The Berkshire atlas survey data has also been combined with those of Bedfordshire, Buckinghamshire, Hertfordshire and Oxfordshire to create the online Thames & Chilterns Bird Atlas.